The ObjexxSISAME Suite consists of ObjexxSISAME and the supporting tools and documentation. ObjexxSISAME performs lumped-parameter structural model extraction and simulation. A range of impact and non-impact events can be modeled with ObjexxSISAME. 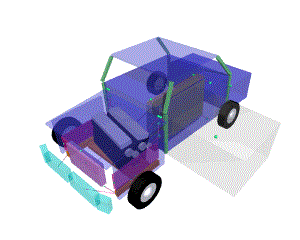 Vehicle (car and truck) crash modeling is well-supported by ObjexxSISAME. 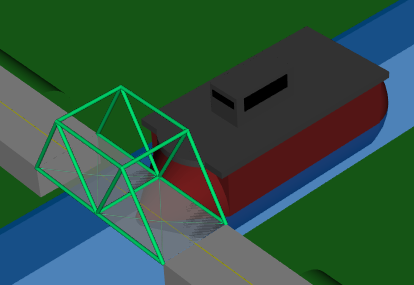 Fixed structures such as bridges and buildings can also be modeled under impact or earthquake events. While nonlinear behavior and plastic deformations are supported to model these severe events ObjexxSISAME can also perform linear domain modeling. Vehicle impact models can be extracted from crash test instrumentation or simulation data and then simulated in a variety of event speeds and configurations. 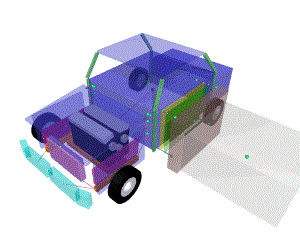 The 3-D modeling capability in ObjexxSISAME supports a wide range of impact conditions including angled offset and side impact vehicle crash modes. ObjexxSISAME provides a workbench for optimal redesign of a structure to best meet a safety performance standard as specified by, for example, desired vehicle occupant compartment or occupant motion histories. Constraints on changes to the structure and component costs can be integrated into the redesign process. ObjexxSISAME can also be used for finite element model tuning to better match test data. This is a direct optimization process rather than an attempt to optimize by trial-and-error simulations or local descent methods. This capability makes ObjexxSISAME a powerful complement to finite element modeling for designing structures to meet impact performance requirements. ObjexxSISAME provides a number of static and dynamic load-path types. Static and dynamic load-path parameters and mass weights can be extracted for given motion and/or force data with a user-supplied model configuration. Defined and extracted load-paths can be combined in the same ObjexxSISAME run, as can instrumented and simulated masses. Instrumented mass motions are filtered to a user-specified cutoff frequency with a special simultaneous motion filter. ObjexxSISAME has a modern graphical interface and is driven by a human-readable, self-documenting input file that specifies the run, model, and output information. Extensive defaulting and input checking are performed. 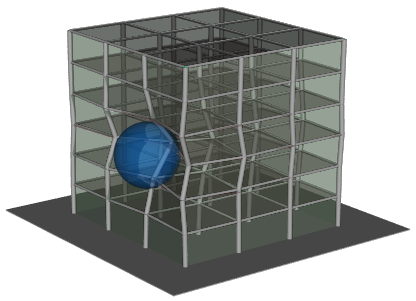 Real-time visualization is provided by OpenSceneGraph views of the model configuration and simulation. A variety of outputs is available including signal files, POV-Ray™ model images, and a simulation-ready extracted model file. An animation post-processor allows multiple animations to be generated from different viewing positions and with different camera motions and observed points from the output of an ObjexxSISAME run. For more information about ObjexxSISAME modeling see the ObjexxSISAME Modeling Overview.